Pokemon have been quite a thing in the Sniff household for the last year or two (before "Go" and Sun and Moon made them trendy again), but a recent expansion has been into the Trading Card Game. For those who haven't played, its a card game played with Pokemon cards. However while the basic game is reasonably fun, what makes it interesting is that you can choose what cards make up a your deck. When you get ripped off at Asda's for a "booster pack" it provides 10 new cards, which you can use to replace cards previously in your deck. Generally you can think of it as a giant game of rock paper scissors, where some cards are better than others, but even some of the weaker ones can come into their own under the right circumstances, so picking the right cards to use is critical. One card such card is called "Greedy Dice". Within the game there is a pile of 6 "prize" cards, dealt randomly from your deck at the start of the game. Each time you knock out an opponent you get a prize card from your own pile, and if you get all 6 you win! The rule for greedy dice is, if its drawn from the prize pile, you toss a coin and if its heads you get to take another prize card! Two for the price of one! However once you actually think about it, is it really such a great card to have in your deck? You're limited to 60 cards, so if you put a GD card in, you need to take something out, so you need to be pretty sure its worth it. So lets do the maths... from 60 cards you have a 1 in 10 chance that one of the 6 prize cards is the GD card. So you'll get something good 1 game in 10? Well not so fast... there are six prize cards, but GD is only useful if one of the first 5. Getting to take an extra prize card does'nt' really help if you've already won. Worst, we forgot about the coin toss, so we get a benefit less than 1 game in 20. So here we've got 60 cards in a deck, 6 of them are placed as prizes, and of the whole deck 4 of them are greedy dice. To represent the deck and the prizes I've made two lists of booleans - we don't actually care what the cards are, so I'm simply going to store yes or no to record if its a GD. So here we go setting up a game. 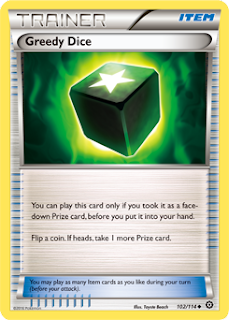 We clear out the cards, and the prizes, and then add 60 regular cards to the list. Then we replace 4 of those with greedy dice. Now we're ready to play! We pick up the first prize card and if its a GD we toss a coin. If its heads then we've found (and successfully used) a Greedy Dice card. If its tails then we actually loose out in the game, as normally we'd get a useful card as a prize - GD is useless except to win a second prize. We keep track of the number of times we benefit. .say join "found " join [found] join " in " join [games ] " games"
Now all we need to do is play a million games! A fraction of a second later, we discover we got an extra prize 167360 times in 1 million games. Thats 16.7% or about once every 6 games. Of course I'm not the first person to figure this out: Here some one comes up with the number: 15.83% That's a little but lower than our result, but you read closely you'll see that he's calculated the probability that you'll get one or more useful GD in any game, whereas we've counted the number of times GD's help - sometime more than one per game. Now when we get a good GD card we call it a win for that match, and stop searching. Doing that we get an exact match up. So not looking good, and about 1 game in 6 to see any benefit. However if you're new to TCG you might want to try the half deck variant - 30 cards and 3 prizes makes the games a little quicker, and its much easier to build a deck from the the cards you happen to have, rather than having to buy extras to make up a sensible 60. If we have 4 GD from 30 we're more likely to pick them for each prize slot (at the cost of taking up a greater proportion of deck space), which should help... except now we only draw 2 useful prize cards instead of 5, bringing the gain down to a useless 13%. Either way you can probably do something more interesting with those 4 card slots than GD. Maybe in some future expansion they'll add a trainer card which lets you do something more useful with the GD card, but for now its just a dead card! We've had a few sunny days recently - the sort of days where some people might sit on the balcony with a drink and maybe relax doing a crossword puzzle. Trouble is I'm rubbish at crosswords. Soduku looks more interesting, but it just seems like mental busywork. Filling in those boxes seems like the sort of thing you should get a computer to do... So... Sitting out, with a drink and writing a program to solve puzzles! That's more the thing. Much as we did for some some of the other puzzle solving programs we start by trying to represent the problem on the computer (while code is the exiting part of programming - its the verbs, the doing, its the "nouns" are at least as important). ....set text to join text "|"
Here we replace letter x of item y of board with [val]. Unfortunately Scratch/Sniff don't support that operation directly (it would be rather neat if it it did, and I may consider quietly adding it...), so we copy the line a letter at a time into newLine, substituting val for the appropriate square. Now its time to actually start thinking about how to solve the problem! What we've done so far is "bottom up" programming. I've built a load of useful things I'm pretty sure I'm going to need, so now I can use them to express the rest of the problem using those tools. The alternative is top-down. Build the program assuming the tools you need exist, then once the whole thing is written go back and fill in the missing operations. The advantage of top down is that you know what tools you need to build, but the neat thing about bottom-up is that you start running the code that you have to do things immediately, even if you're not ready to solve the whole problem. A smart programmer uses both "as appropriate". We're going to go through the board one square at a times and write a value in that square. Then we check if the board is valid. If it is we'll move on to the next square. If not we'll try a different value in this square. If there's no valid number that can go in this square, then we need to go back and change the previous square (which in turn may require going back to the previous square!). This is exactly what a human player would do, but they would use skill and judgement to pick a square with only one or two possible values, so that they never have to go back too far. As we're doing this on a computer which has no skill and judgement then we'll just work through the square from top left to bottom right. This will mean we have to try a lot more combinations that a human would, but foruntatly the computer is super good at that! After some running the initialisation, and printing the initial board (which we've already done - bottom up), we start at the top left and loop until we've covered the whole board. Each time round the loop we pull out the value of the current square, and check if the its a valid move. If it is OK then we move on to the next square. If its not OK then we need to fix that. The easiest way to fix that is to add one to the value in the current square and go round again to see if that fixes things. Unfortunately that's not always possible - if we've already tried all 9 values in that square and none of them have worked, then we need to retreat. If the board is solvable then eventually we'll reach the bottom, and we can print out the completed results (of course during testing we can use the showBoard script a lot more to check the progress, but I've removed those as they're not needed in this final version). Now we've switched to a top-down approach - I need to work out how to write checkBoard, advance and retreat, but once I do this should just start working. Here you can see advance is pretty simple - we just increment x, and if we've reached the end of the line, move on to the next line. However there's an implicit trick in this code... we don't have to worry about fixed positions on the board. Ideally we should skip over them, because we're not allowed to change them, but when we advance we're actually safe to advance to a fixed square, because when we test that its OK the next time round the loop we know that is will succeed because if it wasn't OK, then we'd already have noticed. We will never change fixed squares, so if we advance to a fixed square it must be OK. If the square we're retreating from isn't fixed, then we set it to zero on the main board. Then we move back a square by subtracting 1 from x, and then checking if we need to move up a line. Now we're on the new square we need to check if its fixed. If it's not fixed then we incremented it, to get the new value for that square, and stop the sciprt. On the other hand if it is fixed, or its already reached 9, then we need to retreat further, so we go back around until we find a previous square that we can increment. There are 4 steps to doing that, and the first three shown above are pretty easy: if the current square is 0 (empty) then that's not OK. Then we go along the line - if it contains the current value of the test square at a location other than the current square then that's not allowed either. Similarly for the column. The final check is to make sure that each 3x3 group is valid. The tricky part of this is figuring out which square we're in without writing a ton of code. Unfortunatly to make things worse, Scratch/Sniff are "index from 1" languages. There's nothing wrong with that, and it makes some things much clearer, but this particular bit of code is much more complex. Basically we're dividing by 3 and keeping the remainder to find out where we are in the square. Then we subtract that from the position to find the top left corner of the square. The extra -1's are needed to make it work properly, so that when we access square 1,1 of the group we get the right position. Once we have the origin of the 3x3 group we just loop over the rows/columns checking each square. If we find a cell other than the one we're testing which contains the value, then we have a bad square again. To get there the code considers over half a million possible board positions! But that's OK, because that's what computers are good for.